Wow, as far as consolation prizes go, the Bruins couldn't have done much better. In an incredible and unlikely sweep, every Bruins nominated for an NHL award won. And honestly, I can't argue with any of them. All very well deserved, and I'm pleased to see the voters make the right call. Norris- Zdeno Chara looked as surprised as anyone in the room when his name was called. The big man is always a modest guy but you really got the feeling he was humbled by the honor. His respect for Lidstrom is well documented, and I'm sure it means a lot to Z to win the award while the classy Swede is still playing. People knock Chara very often (as I've been known to on occasion), but simply put, he is by far the premiere shut-down DEFENDER in the game today. He puts up reasonable offensive numbers, which gets him into the Norris discussion every year. But it's his suffocating defensive play that separated him from the rest of the nominees. Lidstrom, clearly, is an excellent defensive defenseman. But not quite as intimidating a presence as Chara. Mike Green, while a potent offensive threat who did great things, shouldn't even be in the conversation. A one-dimensional defenseman, who frankly, is terrible in his own end, should never be up for the same award as Lidstrom or Chara. Once again, it may be time to start up the "they need a special award for offensive defensemen" debate. But I disagree. Voters just need to do what they did this year: select the premiere all-around defenseman. 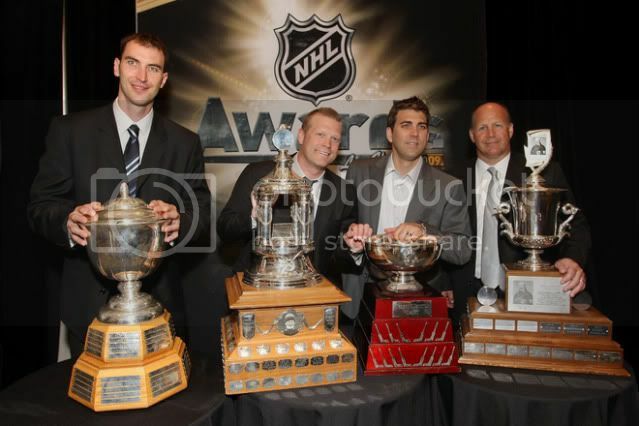 The scary thing about Chara winning this award is, I get the feeling he's going to work extra hard now. His pride won't allow him to rest on his laurels. He'll be motivated now by proving he is worthy of the honor, and will do everything he can to retain it. Jack Adams- Claude Julien is as good as it gets. A class act, intelligent, media-wise and damn near a mind reader, he has all the tools to milk the most from his roster. He came to Boston with a well-earned reputation of a defensive minded coach. While that is fair, it sells him far short. He looked at the Bruins roster last year and quickly realized they weren't going to win too many games playing a wide open style. So he implemented a defense-first system and forced everyone, from star to fourth liner to adhere to it. Fast forward to this season, and we see some major, yet somehow subtle changes. The defensive theory was still strongly in place, yet he allowed a bit more creativity to creep in. He encouraged his defensemen to get more involved in the offense. What he did was essentially show trust in his players. They showed him they could play a sound defensive game, so he eased off the reigns a little, and let his horses run. And what do you know? Those horses ended up scoring the second most goals in the league (Detroit) and giving up fewer than anyone else. His ability to recognize that he had players willing and able to make the sacrifice on the defensive side, allowed the Bruins to break out for an unexpected offensive bonanza. Beyond the X's and O's, Julien was his usual masterful self when it came to motivating players. Be it by a sly comment to the media (while never mentioning names or specifics), or by a benching, demotion or any number of tricks. He always seemed to strike the right note at the right time (sure, I wish he sat Wheeler sooner in the playoffs, but I guess I can't hate him for loyalty). And it wasn't all negative-reinforcement. Far from it. He had a knack of knowing when the guys either needed a day off, or if a "fun" practice was in order. He earned himself a lot of respect among his players the last few years. Finally, he won the award he's been earning since he came to Boston. Jennings- Not a lot you can say about this one, as there was no suspense. This goes to the goaltending tandem of the team with the lowest GAA. Since we knew going in who it was, it wasn't exactly compelling TV. But it was nice to see a couple of Bruins up there, picking up some hardware. I was also pleased for Manny Fernandez, who, through no fault of his own just hasn't had much to brag about as a Bruin. To his credit, through all the dark days as a Bruin, he was a class act. Never once did he complain about not playing enough. He never whined when he was close to returning, and went out of his way to say that he had no problem backing up Tim Thomas since he, and the team were going so well. Vezina- Honestly, has there been a bigger feel-good story winner of any NHL award in recent memory? Tim Thomas, Joe Everyman, walks away with one of sports most prized individual awards. His is a tale of perseverance, struggle, determination and an iron will to prove he belongs. Never getting a whiff of the NHL until he was 30 years old, he's an inspiration to everyone who's ever been told "you can't" or "you aren't good enough". Deep down he knew he was, he just needed someone to give him the chance to prove it. The amazing thing to me is, people still doubt him (especially north of the border, in particular in Quebec Province). All Thomas has done since coming to Boston (after clearing waivers, when all 29 other teams passed on him for a song) is stop the puck and give his team a chance to win every night. Last I checked, that was the job description. Stop pucks. Nowhere in the rule book does it say a goalie has to be 6' 3" of technical precision. There are many many goalies around the league who "look" much more like a Vezina winner. But Tim Thomas is the only one who IS the Vezina winner. I guess some people would rather their goalie looks great than plays great. Maybe it's me, but any time Timmy "flops" "dives" or "scrambles" around to make a stop, it's a thing of beauty. And for the record, Thomas did WAY less "flopping" this year than he ever has. But hey, jealous haters will never see that. Through it all, Thomas has handled it the way he always does. With class, a sense of humor and humility. That didn't change when he was handed the trophy in Vegas. Instead, he had the line of the night when he said "I've been more worried about getting my name on a roster" ...than on the Vezina. He's never come out and said "I told you so", nor will he. But be sure, he feels it. And he'll continue to use that chip on his shoulder to his advantage. He knows the haters out there will scoff at his Vezina as some sort of fluke, or "gift". That's fine. They only fuel his desire to be the best he can be. So while the Bruins fell FAR short of the ultimate prize, they at least garnered plenty of respect around the league. Now the hard part.......living up to the heightened expectations. Honestly, at this point I'm still not sure how I feel about their chances next year. But that's for a later post. For now, all good vibes and a sincere Congratulations go out to all the Bruins who walked away with hardware the other night. 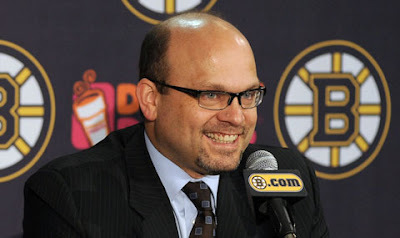 BOSTON, MA - Boston Bruins Principal Charlie Jacobs announced today that the club has signed General Manager Peter Chiarelli to a multi-year contract extension. Per club policy, terms of the deal will not be disclosed. Charlie Jacobs and Chiarelli will hold a press conference on Tuesday, June 16 at 12:00 p.m.
Chiarelli’s club enjoyed one of their best regular seasons in team history in 2008-09, as they posted an Eastern Conference leading 53-19-10 record. Their 53 wins and 116 points were both their third-highest totals in team history, while their 116 points ranked second overall in the NHL, one point behind the San Jose Sharks (117). The Bruins led the NHL in goals against (196) and goal differential (+78) and led the Eastern Conference in goals for (274), second overall in the NHL to the Detroit Red Wings (295). His club swept the Montreal Canadiens in the first round of the playoffs and earned their first Eastern Conference Semifinals berth since 1999. He was honored by The Sporting News as the 2008-09 NHL Executive of the Year from a poll of his peers, which included 39 coaches and executives. Chiarelli has brought a combination of youth and experience in the Boston locker room through free agent signings, trades and player development through the Bruins system. Since being named General Manager on May 26, 2006, the club has acquired Norris Trophy finalist Zdeno Chara, Marc Savard, Michael Ryder, Shawn Thornton, Blake Wheeler and Stephane Yelle through free agency; Manny Fernandez, Andrew Ference, Shane Hnidy, Chuck Kobasew, Steve Montador, Mark Recchi, Aaron Ward and Dennis Wideman through trades; and extended the contracts of Vezina Trophy finalist Tim Thomas, Patrice Bergeron, Kobasew, David Krejci, Mark Stuart, Marco Sturm, Ward and Wideman. He also oversaw the development of the club’s younger talent including Byron Bitz, Matt Hunwick, Phil Kessel, Krejci, Milan Lucic and Stuart. His strategy led the 2008-2009 Bruins to a 22-point improvement over their 2007-2008 record and a 40-point improvement over their 2006-2007 mark. He led the Bruins to their first back-to-back playoff appearances since 2002-2003 and 2003-2004. In three seasons with the Bruins as General Manager, Chiarelli has amassed a 129-89-28 record and .581 winning percentage.Off the ice, Chiarelli has expanded his Hockey Operations Staff during the last three seasons by hiring Assistant General Manager Jim Benning, Director of Hockey Operations and Player Development Don Sweeney, Director of Amateur Scouting Wayne Smith, Director of Collegiate Scouting John Weisbrod and promoting Scott Bradley to his current position of Director of Player Personnel. He was an integral part of bringing Bruins legend Cam Neely back to the organization in his current capacity as Vice President. He also serves as General Manager for Boston’s American Hockey League affiliate in Providence and that club has posted a 142-77-21 record and .635 win percentage in his three seasons. Chiarelli promoted Rob Murray to head coach of Providence after Scott Gordon left the club to become head coach of the New York Islanders. Key players on the P-Bruins roster acquired during Chiarelli’s tenure include goaltender Tuukka Rask, leading scorer Martin St. Pierre and Johnny Boychuk, named as the AHL’s top defenseman for 2008-09. Prior to joining the Bruins, Chiarelli spent seven seasons with the Ottawa Senators, five as their director of Legal Relations and two as Assistant General Manager. A native of Ottawa, Ontario Chiarelli played four seasons of college hockey at Harvard University, where he served as the team’s captain. He had 21 goals and 28 assists for 49 points in 109 collegiate games and earned his degree in Economics in 1987. He obtained his law degree from the University of Ottawa and was admitted to the Ontario bar in 1993. Chiarelli spent six years as a lawyer and player agent prior to joining the Senators front office. According to the Ottawa Sun, Bruins leading goal scorer and current restricted free agent Phil Kessel is seeking a $5 million a year contract. 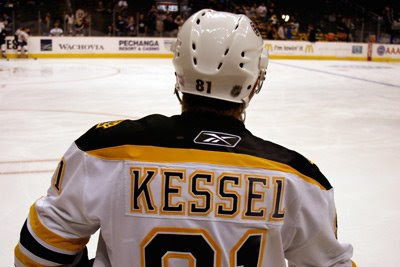 The Bruins, however, aren’t willing to dish out such loot for Kessel, who underwent successful shoulder surgery earlier this offseason following a career year in which he scored 36 goals and 24 assists in 70 games. Boston is already paying forwards Marc Savard $5 million, Patrice Bergeron $4.75 million, and Marco Sturm $3.5 million as well as Krejci, who will make $3.75 per year. 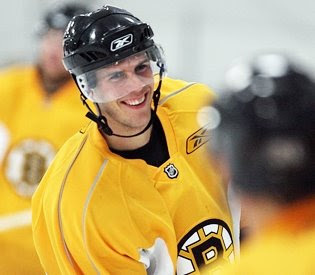 Bruins move to sign David Krejci - Who's thought to have the make up of an Steve Yzerman, King Joe Sakic or an Adam Oates! The Bruins gave their first glimpse into this summer’s master plan yesterday, when it was announced that 23-year-old center David Krejci had signed a new long-term contract. Canada’s TSN reported the deal is for three years with annual salaries of $3.5 million, $3.75 million and $4 million. The numbers represent a tidy raise for a player who earned $850,000 this past season. The B’s retention of Krejci, who could have become a restricted free agent July 1, hardly was a surprise. Despite playing all season with a painful hip injury that will require surgery later this week, the Czech Republic native continued his ascent toward stardom. He played all 82 regular-season games and posted 21 goals and 51 assists, along with a plus-37 rating that led the NHL. No way the Bruins were letting him go anywhere - or even attain RFA status, under which an offer sheet raid by another team might have been conceivable. Not so certain is whether the B’s will hang on to winger Phil Kessel who also is headed toward RFA status next month. One source said yesterday the Bruins might trade Kessel for a high first-round pick in the upcoming NHL draft, with the Colorado Avalanche (picking No. 3) a possible partner. Such a deal could make sense for the Bruins because veteran sniper Marco Sturm, who missed most of last season with injuries, will be back. The Bruins are facing probable salary cap issues, and if they do not have to pay Kessel, who likely will command the same type of money as Krejci, it would somewhat ease the dollar pinch general manager Peter Chiarelli is in while assembling the 2009-10 roster. Speculation also persists that center Marc Savard, who at season’s end indicated a willingness at least to consider waiving his no-trade contract (he has one year left at $5 million) so that he could play elsewhere, will be moved. The mere notion that Savard could be dealt underscores the value of Krejci, who is seen by many as having the skills and makeup to be another Steve Yzerman, Joe Sakic or Adam Oates - all supreme playmakers with the added ability to score goals and be strong at both ends of the ice. “I had Yzerman,” longtime NHL coach Jacques Demers said during the B’s first-round series sweeep of the Montreal Canadiens. “I named him captain at 20 years old. I saw him gradually become a great player. He worked hard at becoming great. Krejci has all the tools to become a great player. He does so many things that most people might not notice. And that was before anyone knew that he was plagued by a torn labrum in his hip, an injury that will require repair and 4-6 months of rehab work. B's NewsBlast! - (The King!) Krejci Signed to a Multi-Year Extension! BOSTON, MA - Boston Bruins General Manager Peter Chiarelli announced today that the club has signed forward David Krejci to a multi-year contract extension. Per club policy, terms of the deal will not be disclosed. Chiarelli and Krejci will be available to the media via conference call on Wednesday, June 3. Those call-in details will be released the morning of June 3. Krejci established a career high in games played, goals, assists and points this season with 22-51=73 totals in 82 games. 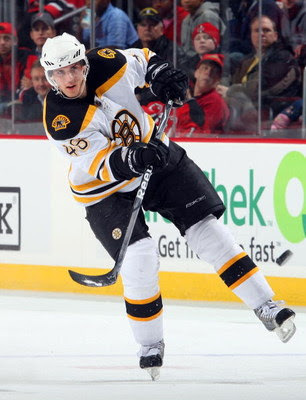 His 51 assists ranked him second on the team behind Marc Savard, and he led the NHL with a plus/minus rating of +36. In 2009, Krejci also received the Bruins Seventh Player Award, given to the player who performs above and beyond expectations.The 23-year-old native of Sternberk, Czech Republic was originally drafted by the Bruins in the second round (63rd overall) in the 2004 NHL Entry Draft.